Kathakali, literally translated as “story-play,” is a classical Indian dance rooted in Hindu mythology. This dance, which is briefly mentioned in Arundhati Roy’s novel, The God of Small Things, is indigenous to Kerala, a small state in southwest India. Thematically, the dance focuses on the “treasure-trove of the ancient Puranas chronicling the lives, loves, and conflicts of the gods and the supermen of mythology” (Bhavnani xiii). The dance itself is performed in a makeshift open-air theater provided by a temple courtyard or a family mansion. A pair of attendants holds up a patchwork quilt, which functions as a curtain. The most important accessory to the performance is a brass oil lamp, as its quivering wick greatly accentuates the various shades of expression on the painted faces of the actors (Bhavnani xiii). In the actual performance, there are three main types of characters: the Satvik (virtuous beings) which include gods, kings or heroes; the Rajasik, characters with specific vices, such as greed, lust, or vanity; and the Tamasik, the evil characters, such as demons (Massy 54). The basic moral is always that of the eternal warfare between good and evil (Ambrose 62). Some very well known and popular subjects of the Kathakali dance are as follows: Bhagavat Doothu, Lalita, Rukmani Kalayanam, Sita Kalayanam, Rama Charitam, and Prahlada Charitam (Bhavnani 48) (see Arranged Marriages, Matchmakers and Dowries in India). Kathakali dancers spend at least twelve years training and studying, so they may learn to achieve a necessary perfect control of their body and limbs (Ambrose 63). Training begins with massages and oil baths that will make the body soft and flexible, thereby “awakening” each muscle, joint, and nerve. Each part of the dancer’s body is disassociated from the others, and is taught to function separately. These massages are designed to help the dancer achieve the basic posture of Kathakali, which is a specific arrangement of the entire body (Bowers 78). The chin presses tightly against the throat, and the face looks straight ahead. The buttocks push back so the spine forms a concave curve from the back of the head to buttocks. The knees are widely spread apart, so that the profile of the body has a flat thinness, and the front view shows a perfectly shaped diamond. The arms are extended straight out from the shoulders and are parallel to the ground, and the wrists form right angles between the hands and arms, while the hands hang limply (Bowers 79). The basic step of Kathakali is a sort of box step. While holding the basic position as described above, the step moves as follows: right forward one step, left foot joins it; right foot to the right one step, left foot follows; right foot back one step, left foot follows; left foot to the left one step, right foot follows, and repeat. (Bowers 79). Explanatory gestures and movements compliment the step, and the tempo may vary in speed, from a simple walk to bouncing leaps. Dancers also undergo a rather painful training of the eyes, so that they develop the ability to communicate a wide range of emotions and experiences entirely through the eyes, and without any benefit of supplementary gestures (Bowers 81). Kathakali includes a gesture language composed entirely of hand symbols. This gesture language is grammatically equivalent to speech, and is used within a dance to creatively perform acts, describe objects and scenes, rhythmically express sentiments, and translate the poetry of words into mimic gestures (Devi 104). 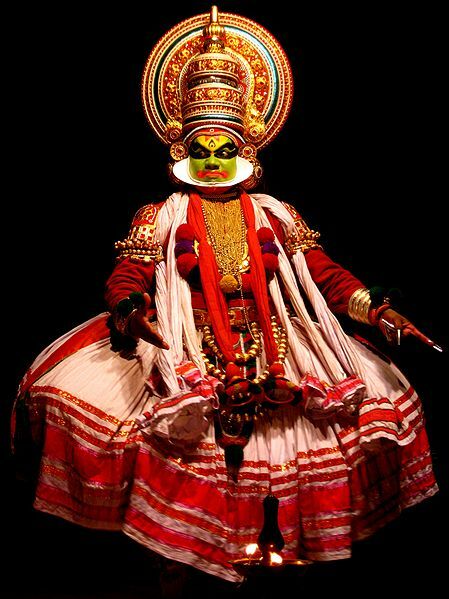 The Kathakali dancers wear elaborate make-up, which takes several hours to apply, in order to enhance the facial expressions and the overall dramatic effect of the performance. The make-up itself is composed of rice powder that is enhanced by lime and certain paints. Each face mask represents a different character (Bhavnani 46). Cenda is a drum that is suspended by a cotton thong or leather strap from around the neck, and is played with two slightly up-turned bamboo sticks by both hands. It produces a shrill, high staccato sound. Maddalam is a drum fastened to the waist by a cotton belt. It is played on both ends by both hands, with the right-hand fingers covered with metal thimbles in order to produce a powerful and sharp sound, and the left hand holding a stick. Gong is a thick, small, round, metal-alloy plate. The singer holds it by a thread-loop that runs through a hole pierced in its bent rim, and he beats it with a small stick. The primary function of the gong is to give rhythmic beats. Singers also stand in the orchestra, generally in a group of two or three. They sing songs that are based on old modes of melodies in Karnatak music sung in Kerala temples. Such songs are narrative, and what the singers sing is communicated by the actors (Pandeya 141-142). A Kathakali performance may last as long as sixteen hours. At sunset, the program begins with a drumming that announces the performance, followed by a series of religious songs and praise to the gods. Around nine or ten o’clock, the “behind the curtain dance” (known as Todayam) begins. Audience members who want to watch may walk behind the curtain to see. Following this dance is more devotional singing and drumming, and then the dance drama begins, which is performed in sequences that reveal a plot and tell a connected story (Bowers 67). Entire episodes from ancient epic poems, such as the Ramayana and the Mahabharata, are danced and enacted (Bhavnani 42). The performance usually ends with a religious dance that is performed by an actor costumed as one of the Hindu gods, so that the evening is concluded with a general benediction that showers blessings on all who witnessed and participated in the holy spectacle (Bowers 67) (see Postcolonial Performance and Installation Art, Hybridity and Postcolonial Music). Ambrose, Kay. Classical Dances and Costumes of India. London: Whitefriars Press Limited, 1950. Bhavnani, Enakshi. The Dance in India: The Origin and History, Foundations, the Art and Science of the Dance in India – Classical, Folk and Tribal. Bombay: Taraporevala Sons & CO. Private Ltd.,1965. Bowers, Faubion. The Dance in India. New York: Colombia University Press, 1953. Devi, Ragini. Dance Dialects of India. Delhi: Motilal Banarsidass Publishers Pvt. Ltd., 1972. Pandeya, Avinash C. The Art of Kathakali. New Delhi: Munshiram Manoharlal Publishers Pvt. Ltd., 1999. Massy, Jamila and Reginald. The Dances of India: A General Survey and Dancer’s Guide. London: Tricolor Books, 1989. Bharatha, Iyer K. Kathakali: The Sacred Dance-Drama of Malabar. London: Luzac, 1955. Daugherty, Diane. “Fifty Years On: Arts Funding in Kerala Today.” Asian Theatre Journal Vol. 17, Issue 2 (2000): 237-252. Dezsy, Eric Salzman and Thomas Desi. The new music theater : seeing the voice, hearing the body. New York : Oxford University Press, 2008. Erdman, John L. “A Tradition of Change: The Role of Patrons and Patronage in the Kathakali Dance-Drama.” Arts Patronage in India: Methods, Motive, and Markets. New Delhi: Manohar, 1992. Lowen, Sharon and Videshi Kalakar Utsav. The performing arts of India : development & spread across the world. Gurgaon, India : Shubhi Publications, 2005. Mahabharata: Music, Songs & Rhythms From Kathakali. June 2000. CD. Singh, Nagendra Kr and David Bolland. The Ramayana in Kathakali dance drama. Trans. David Bolland. Ed N.K. Singh. Vālmīki. New Delhi : Global Vision Pub. House, 2006. Zarilla, Phillip B. The Kathakali Complex: Actor, Performance, Structure. New Dehli: Abhinav, 1984. —. Kathakali Dance-Drama: Where Gods and Demons Come to Play. New York: Routledge, 2000. Kathakali’s roots are unclear. The fully developed style of Kathakali originated around the 17th century, but its roots are in the temple and folk arts , which are traceable to at least the 1st millennium CE.